It seems that every year or so, the unveiling and delivery of a new supercomputer that trumps the previous speed record sweeps the headlines. In fact, there are so many of these supercomputers these days that there is a website that keeps track of all of them: the Top500. The worldwide list of fastest computers that has been compiled twice a year since 1993. The United States has always retained various spots in the top rankings of the Top500 and until now had maintained a #1 spot for the past two years with the Jaguar - Cray XT5-HE Opteron Six Core 2.6 GHz which is housed at the Oak Ridge National Laboratory. Last year, the Jaguar passed a benchmark test at 1.759 petaflops (quadrillion mathematical calculations per second). We are all used to personal computers with dual cores or even quad cores, but the Jaguar system boasts 224,256 x86-based AMD cores -- That should give you an idea of its core speed. But as powerful as the Jaguar is, China was right on its tail. A few upgrades later, Jaguar is now in a cloud of dust as China's new supercomputer blows right past. Just yesterday at the Annual Meeting of National High Performance Computing in Beijing, the supercomputer was unveiled for all to see; fully functional and ready for business. The $88 Million, Tianhe-1A (meaning Milky Way) computer uses 7,168 Nvidia Tesla M2050 GPUs, 14,336 Intel Zeon CPUs stacked into 103 different cabinets weighs over 150 tons & consumes just over 4 total megawatts of power. All those numbers working together means that it is 1.4 times faster than Jaguar. 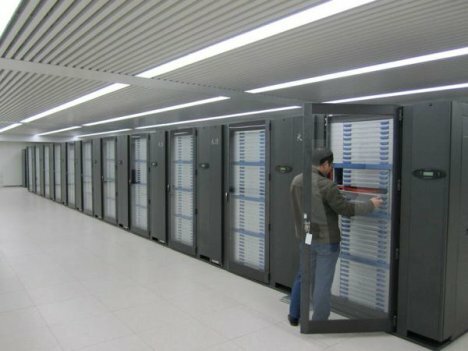 The new Chinese Supercomputer is capable of a sustained computing environment of 2.507 petaflops. To give you an idea on how fast the Tianhe-1A actually is, here's a statement from the actual press release from Xinhua News which was posted on the National University of Defense Technology; the organization who developed the record-breaking machine -- "A single-day task for Tianhe might take a mainstream dual-core personal computer 160 years to complete, working non-stop -- if it can last that long." The computer is already starting to churn data for the Chinese weather service and the National Offshore Oil Corporation but I have a feeling that it will be working non-stop with a line of researchers wanting to take advantage of its amazing speeds. All of these supercomputers still operate using silicon as the main ingredient in their transistors. I'm sure you have heard me speak of Moore's Law on several occasions, so these kinds of upgrades can only last so long before we have to find a suitable replacement. If you remember from my post on Graphene -- which ended up going viral -- I stated that IBM has already been working on graphene-based transistors. They have already tested a 100GHz one and state that a 1THz processor is on the horizon. So, just imagine if you startgetting thousands of these types of processors working together. The kind of supercomputer that would unveil! I suppose that for now we can only imagine the data-churning possibilities of such a thing. But who knows? It may come sooner than you think.